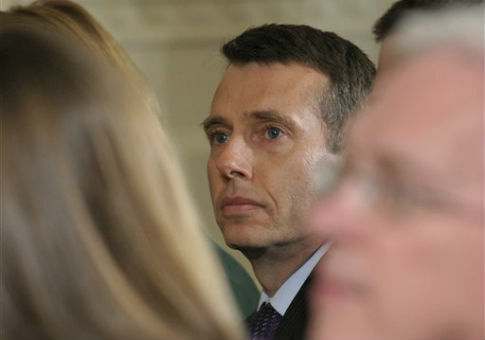 The man behind former President Obama's historic 2008 election victory, David Plouffe, has been issued a large fine for illegal lobbying practices. The Chicago Board of Ethics slapped a $90,000 fine on Plouffe, a former top Obama adviser, for illegally lobbying Mayor Rahm Emanuel on behalf of the ride-sharing company Uber when he was senior vice president of policy and strategy in 2015, the Chicago Tribune reported Thursday. The board voted 5-0 that Plouffe violated city ethics rules by failing to register as a lobbyist after personally contacting Emanuel on behalf of Uber. Plouffe emailed Emanuel, Obama's former chief of staff, on Nov. 20, 2015, about his concerns with regulations regarding the city's pickup fees and the requirement to display an airport pickup placard in Uber vehicles. "Assume both of us thought the airport issue was settled and we would never have to discuss again, but unfortunately two significant new hurdles were introduced," Plouffe wrote. "Coming to you because of their severity that would prevent us from operating. We were all set to announce Monday we were beginning pickups." The message also insinuated that the November exchange was not the first time Plouffe lobbied Emanuel on city regulations. "Sure this comes as much of a surprise to you as us, since there was an agreement in place," Plouffe wrote. "I hope we can resolve these issues before the holiday. Our team is eager to move forward and begin operating at the airports in advance of the Thanksgiving holiday–as you called for and we'd like to deliver on the schedule for you." Emanuel immediately responded to have Plouffe get in contact with his advisers. The messages did not become public until December, when Emanuel "released hundreds of personal emails related to public business under the pressure of two open records lawsuits alleging the mayor violated the state's open records law," according to the Tribune. The penalty for each lobbying violation in Chicago is a $1,000 fine, but, according to the city's ordinance, "each day that a violation continues shall constitute a separate and distinct offense to which a separate fine shall apply." Because Plouffe did not register as a lobbyist until April 13, 2016, he was fined $90,000 to reflect the 90 business days he failed to register after first contacting Emanuel. This entry was posted in Politics and tagged Chicago, David Plouffe, Lobbyists, Rahm Emanuel. Bookmark the permalink.